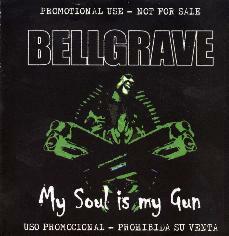 Bellgrave - "My Soul Is My Gun"
Although this German band has been around since 1999, this is the bands first release on the Spanish, Locomotive Records. The CD features 14 songs of mostly hard driving, snotty heavy metal! A few tracks like "Coma State" slow it down but the rest runs away like a freight train. I really miss the guitar solos on this riff rock mania. The songs that have solos are great, so the guy can play and he is quite creative. Not a bad debut even though the band do recycle a few riffs too many. For more information you can visit the Bellgrave web site at: http://www.bellgrave.de. Visit the Locomotive Records web site at: http://www.locomotivemusic.com.